Installation shot of 'Colour is' featuring works by Peter Halley, Paul Feeley and David Batchelor. Photo credit: Todd-White Art Photography. David Batchelor and Briony Fer in conversation discussing Batchelor’s art practice as well as the varied artistic investigation of colour in the twentieth century. 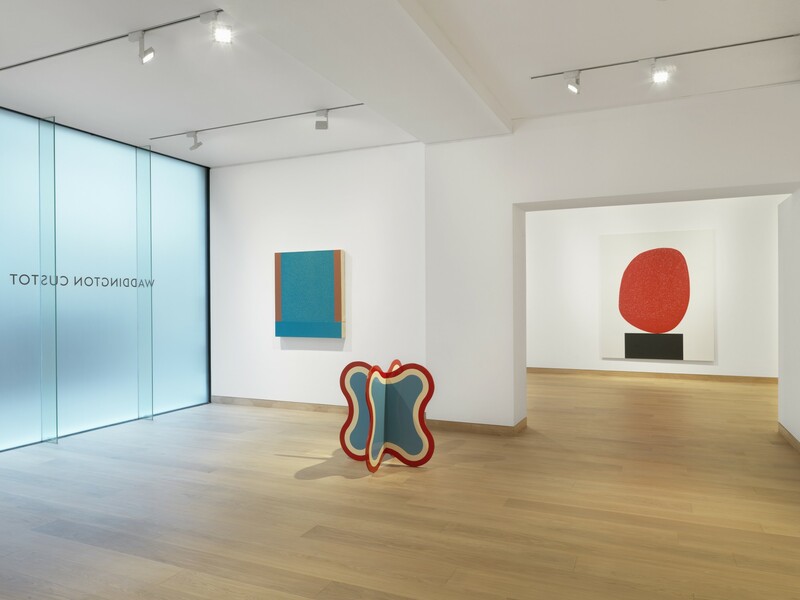 Waddington Custot’s current exhibition Colour is focuses on the wide-ranging and sometimes contradictory investigations of colour by artists from the mid-twentieth century to the present. The exhibition draws together painting and sculpture from an international group of artists who consider colour central to their practice: Etel Adnan, Josef Albers, David Annesley, David Batchelor, Anthony Caro, Ian Davenport, Paul Feeley, Sam Gilliam, Peter Halley, John Hoyland, Donald Judd, Joseph Kosuth, Jeremy Moon, Kenneth Noland, Hélio Oiticica, Yuko Shiraishi, Frank Stella, Joe Tilson and William Tucker. David Batchelor is an artist and writer based in London. Born in Dundee, Scotland in 1955, he studied Fine Art at Trent Polytechnic, Nottingham (1975-78), and Cultural Theory at Birmingham University (1978-80). Recent exhibitions include Chromatology, AB-ANBAR, Tehran (2017); Monochrome Archive 1997-2015, Whitechapel Gallery, London (2015); Concretos, New Art Centre, Salisbury (2014); Wall to Wall, Centro Universitario Maria Antonia, São Paulo (2013); Flatlands, Spike Island, Bristol and The Fruitmarket Gallery, Edinburgh (2013); and Colour Chart, Museum of Modern Art, New York (2008) and Tate Liverpool (2009). Batchelor’s books include The Luminous and the Grey, an inquiry into when colour begins and when it ends, both in the material world and in the imagination (Reaktion Books: London, 2014) and Chromophobia, on colour and the fear of colour in the West (Reaktion Books, London, 2000). He also edited Colour (2008), an anthology of writings on colour from 1850 to the present, published by Whitechapel, London and MIT Press, Cambridge, Massachusetts. Briony Fer is Professor of History of Art at UCL, London. In 1980 she joined the History of Art Department at the Open University as a Lecturer working on groundbreaking courses there and publishing essays in the Modernity and Modernism textbooks, published jointly by the Open University and Yale University Press in 1993. She joined University College in 1990 and was made a Reader in 1997 and Professor in 2005. She has published extensively on 20th century and contemporary art, key publications include her books On Abstract Art (2000) and The Infinite Line (2004), both published by Yale University Press. She has written on many contemporary artists, including Gabriel Orozco, Roni Horn, Vija Celmins, Ed Ruscha, Rachel Whiteread and David Batchelor. Much of her research has focused on the work of the American sculptor Eva Hesse, writing for the 2002 retrospective of the artist curated by Elisabeth Sussman at SFMOMA in 2002.